I don't know how many of you watch Shark Tank, but I was super excited when Balm Chicky Balm Balm reached out to me for a review. Their products are changing the way we use lip balm. You know that pesky friend of yours who always forgets to bring their own lip balm, but wants to share yours? Balm Chicky Balm Balm created the "friend end" tube as a solution. The main side twists up for your use, while the other end is a smaller section for friends. The product is divided so that you never have to share the same product again. I love the idea because you can share the love without sharing the germs. The friend end isn't the only great thing about these balms. They are all natural, and three times the size of a standard lip balm. They retail for a bit more than your standard tube at $7, but similar products retail for around $3.50 for a third of the size. Balm Chicky Balm Balm currently comes in five different scents including: Juicy Melons, Wild Mountain Honey, Huge Cucumber & Mint, Sweet Baby Ginger, and Hot Chocolate Love. Check out that friend end in action! You can find Balm Chicky Balm Balm online and in select Target stores. The lovely ladies at Balm Chicky are sponsoring a givaway! Four lucky readers will win a trio of lip balms. Here's part two of the Protector Pick-ups collection. These will be released on May 28th at 6pm MST in the Firecracker Lacquer store. If you missed part one, you can find it here. Notes: I'm a bit biased because green is my favorite color, but I just love this one! Notes: This is one of those polishes that is tricky to capture accurately on camera. There are additional color shifts that my photos didn't pick up. Check out the bottle shot in the macro collage for a better example. Notes: If you are obsessive over gray like I am, you need this one in your arsenal. If you haven't seen it yet, you need to check out I Love Nail Polish's Spring 2015 collection. 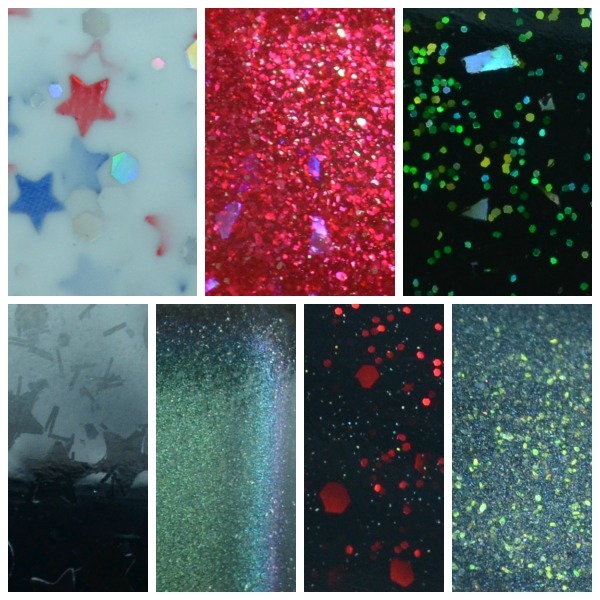 It contains swoon worthy shades that range from holographic to multi-chrome flakies. There's really something for everyone. This manicure features ILNP Flower Girl (pink), ILNP Timeless Vow (green), and a handful of nail gems from Firecracker Lacquer. The nail gems were supplied as a press sample, but everything else was purchased by me. Notes: There are so many good things happening with this green! *Nail gems were provided by Firecracker Lacquer for photo purposes. I am pretty excited ecstatic to share my swatches of My Darling Curios polishes. This might be one of the quickest turn-around times ever for my blog. The colors are lovely, and I even had someone say that they reminded them of pretty cupcakes. Formula: Easy application with no glitter fishing. Notes: This color is similar to Revlon Whimsical and Deborah Lippmann Glitter in the Air. I personally prefer this shade over the other two. I really enjoyed all of the colors, and I can't wait to see what may be in store for My Darling Curios. I'm back with another makeup review! This is my very first experience with full face primer, and I'm pretty excited to share it with you. It took several weeks to patch test, but it passed with flying colors. I'm going to be completely honest as always. It took me a while to get the hang of closing my eyes and getting the product to spray directly at my face instead of toward my ear. This is no fault of the product, rather the fault of my own abilities. Overall the primer spray is so subtle that you won't even know you are wearing it. I was really pleased with the oil control it provided throughout the day. A quick search on CosDNA shows that there are a few potentially irritating ingredients. Denatured Alcohol is fairly high up on the list, but from what I've read it seems like a fairly popular ingredient in many oil control products. If you have any sensitivity to alcohol I recommend searching for an alternative product. As always, if you choose to give this a try be sure to patch test it first. You don't want to be that hottie in the ER because your face reacted with hives. While I don't have another product to compare to Skindinavia Primer Spray, I feel confident in saying that I would purchase this in the future.